Valvular heart disease is an important consideration in patients with different clinical presentations such as shortness of breath, chest pain, syncope, and hypotension . Correct identification of valvular heart disease requires good knowledge of anatomy, pathophysiology and advanced ultrasound applications(such as color and spectral Doppler), as well as excellent ultrasound examination skills. In most cases, precise quantification of the valvular pathology requires comprehensive echocardiography using a high-end ultrasound platform . 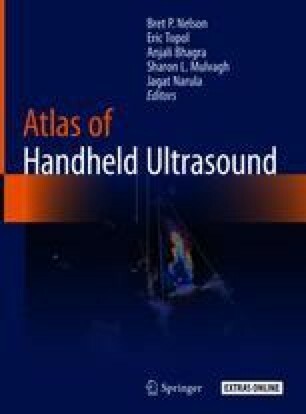 Point-of-care ultrasound may assist in identification of common valvular diseases, but caution should be exercised in interpreting the abnormalities by less experienced examiners, especially ruling out significant valvular heart disease based on limited ultrasound examination (Figs. 20.1, 20.2, 20.3, 20.4, 20.5, 20.6, 20.7, 20.8, 20.9, 20.10, and 20.11; Videos 20.1, 20.2, 20.3, 20.4, 20.5, 20.6, 20.7, 20.8 and 20.9) . The online version of this chapter ( https://doi.org/10.1007/978-3-319-73855-0_20) contains supplementary material, which is available to authorized users. All videos courtesy of Dr. Edgar Argulian.